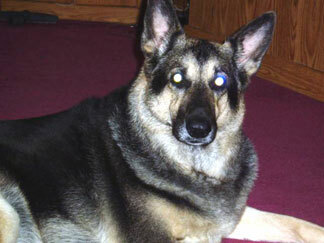 I have a wonderful Shepherd that is 13yrs. old. He is the best companion dog that my wife and I could ever have. His Health is good for an older dog, but he is starting to fall when our other pup gets playful with him, and he has a hard time walking, especially in cold weather. His eyes are starting to get glazed over also. My wife told me the other day that in the last few months he is starting to whimper a little when he lays down. I am currently in Iraq and I really hate that I dont get to see him. My question is should we have a vet look over him and have some X-rays taken to see if anything can be done? We give him supplements and he is not overweight. I do not want to see him suffer.He is such a proud and wonderful part of our family. What should we do? Thanks. Good advice from Debbie and Bette. I would add a vet check for a blood panel and thyroid. The thyroid could be affecting health in subtle ways. Time flies by with our furry family members and it breaks your heart when one day they are showing their age. My last gsd made it to almost 16, but he did have many health issues as he got older...ACL, arthritis, elevated thyroid, cataracts, and a bout of CVS. So enjoy him, cherish him and stay safe yourself! Dausuquin supplement which does have glucosamine/chondroitin in it. My male GSD is 10 1/2 and was getting a little sluggish so I heard that agility people use the Dausuquin for their older dogs. I got some (we're now on our third month) and I can really tell the difference. He doesn't strain as much to get up off the floor, he's friskier and all round healthier, it seems. As far as overweight I will take a chance and say he does look a bit overweight or it may be the angle of the photo, but if you can't see a very distinct waistline when he's up and you're looking down on his back, then he's overweight. The dog food mfg. would have us feeding our dogs 2x-3x more than they really need. The bag of my Senior Innova bag says 4 3/8 cups per day for his 80 lbs. I give him 1 1/2 + 1/3 can of Innova wet food. Would he like more? Of course, what dog wouldn't. But that's plenty if I want him to stay healthy. Most pet owners grossly overfeed their pets and then the vet tries to sell them on weight reducing drugs! He gets a few treats a day and they are all organic or natural like Paul Newman's which are very reasonably priced. Taking a few pounds off could add a couple of years to your best buddy's life. Hi Michael, First of all at his age you can expect several issues to start happening and due to his age - sooner rather than later. I would expect the getting up and down issues to be arthritis based however it could be something else too but at his age arthritis is a good bet. I would hightly suggest you get some Glucosamine/Chondrotin supplements and start giving him those daily - just like you would to a person. I have both my 9.5 year olds on it and it does make a huge difference in how they get around. A heated bed is another good thing to get for a larger senior dog to help those old bone and joints feel better. And if not a heated bed, one of those ultra thick "senior" dog beds are really good. And last but not least, I would encourage you to get your fellow in for a senior check up as soon as you can to see what else is going on in your old boy. I'll try and put a link to some heated beds for you below. Good luck with your old boy!